Let’s start his week with Motorola, and the fact there have been several images leaked online which show four forthcoming Motorola smartphones. The so far unannounced smartphones are the 2015 Moto X, the Moto G and the anticipated new flagship ‘Droid’ smartphone along with the Droid Mini. No official details have been disclosed by Motorola as yet, usually new smartphones are announced at the end of the summer so it could be a few more weeks until we get the authorised information. 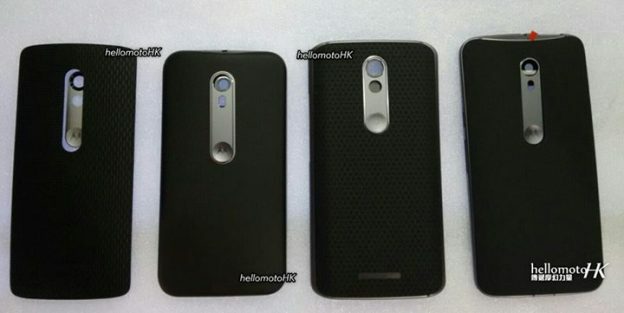 The 2015 Moto X is anticipated to include a 5.5-inch QHD screen and the new Snapdragon 810 processor. We’ll bring you more as we get it. From Motorola to LG, who have just announced nnother version of the LG G4 smartphone – the G4 Beat. The G4 Beat is a mid-range smartphone and is smaller with a 5.2-inch display compared to the 5.5-inch display sported by the original LG G4 handset. The specs are also different to the full-sized G4, as the G4 Beat is definitely pitched in the mid to lower range. So it will come with an 8-megapixel rear-facing camera and a 5-megapixel camera on the front. It will be powered by the octa-core Snapdragon 615 processor alongside 1.5GB of RAM and it also has 8GB of built-in memory. LG said their aim for the G4 Beat is to offer a smartphone which is ‘well balanced’ and ‘delivered terrific value and satisfaction’. The G4 Beat will be available in some countries including Germany, France and Brazil later on this month and will be roll-out worldwide at a later date. And finally, Apple’s hotly awaited contactless payment system – Apple Pay – went live in the UK last week. The UK is second only to the USA to get the new on-the-go way to pay for goods and services using an iPhone 6 (or 6 Plus) or an Apple Watch. Here in the UK, our contactless payment system is already pretty advanced so the contactless card readers already in use for debit and credit card transactions can also be used for payments using the Apple Pay system. In effect Apple Pay works in a similar way except you hold your iPhone or Apple Watch close to the card reader rather than your credit/debit card. You need to place your thumb on the Touch ID fingerprint sensor on an iPhone and press the side button twice on the Apple Watch to confirm the transaction and hey presto the money is debited in a matter of seconds. If you want to use it on the London Underground or anywhere included on the Transport for London network, you can use your iPhone or Apple Watch in the same way as you would use an Oyster card by simply touching the Oyster card readers with a compatible Apple device. At the moment, there is a £20 upper limit for most contactless payments, this is set to rise to £30 in September. There are several companies in the UK however which don’t have an upper limit and these include Wagamamas and Prêt A Manger. It’s also possible to select which card to use for specific transactions using Apple Pay. Credit and debit card details are stored in the iOS Passbook app which will be known as ‘Wallet’ when iOS9 is up and running. To select a particular card you need to hold your iPhone over the card reader making sure you don’t touch the home button. It then brings up the details of your stored cards and you can just tap your iPhone screen to select the one you want to use. In addition to using Apple Pay in shops and businesses, it can also be used for online purchases of goods and apps. Currently the banks and card companies in the UK which have signed up to Apple Pay and are up and running are Santander, NatWest, Royal Bank of Scotland, Nationwide, MBNA and American Express. Our other main banks including Lloyds, HSBC, First Direct and Halifax will be joining Apple Pay in the near future.